Keep it maintained for a formal look or let it grow its natural course like the hedge above for a more natural look. How do you choose to define a boundary? You will see all different ways that homeowners try to distinguish their property from their neighbors. Monuments, fences, topography, and planting are all used to separate themselves from others. Without this green wall there would be a lacking of color and soft elements to the space. At FWL the hedge is our best resource when creating a boundary between properties. Even though a fence is an instant screen, a hedge supplies more than just a boundary line; it is functionally, aesthetically, and naturally beneficial to a yard. Hedges cool a space. Hard materials radiate heat increasing the overall temperature of the surrounding area. In a small space this can be felt drastically. Because of an increase in temperature a plant will go through transpiration releasing water into the air cooling down the nearby temperature (kind of like sweating). This is a natural process that we can tap into and use for our gain. A hedge also adds color and with small spaces people typically want as much usable space (aka hardscape) as possible. 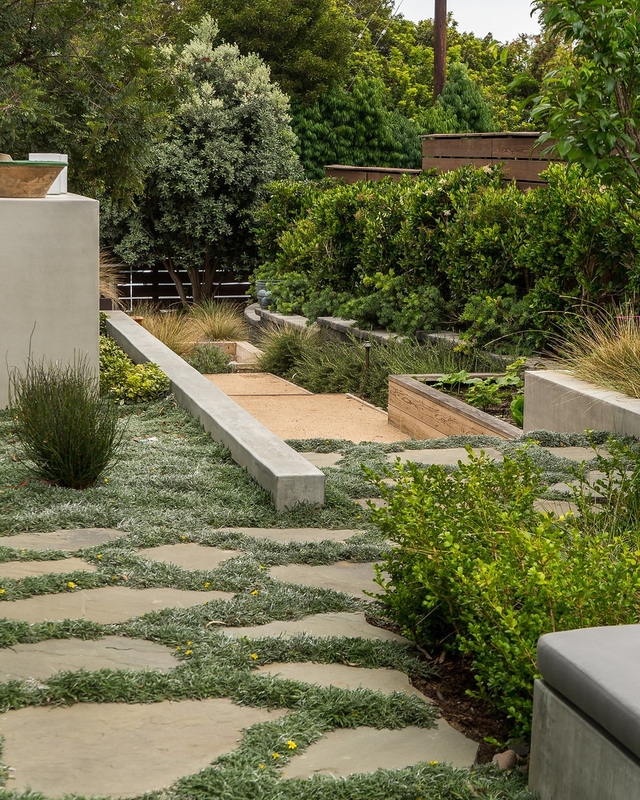 With the use of boundary plantings we can offset the monochromatic palette created by hard surfaces and add some color that is pleasing to the eye. For small spaces we suggest using Bamboo; it grows up more than out giving you more usable space. Hedges are also a great buffer when it comes to blocking noise from nearby streets or highways. Plants absorb noise especially noise with higher frequencies that people find most annoying. Walls and buildings reflect noise lending to voices and sounds carrying longer than usual. Try planting evergreen shrubs that have broad leaves and thick stems, the more foliage, the more it can absorb. Some of our favorites include: Podocarpus (gracilior/icee blue) it is slow growing but is less maintenance in the long run. Ligustrum takes pruning well and blooms throughout the year exposing a white fragrant flower. Some others include Feijoa sellowiana, Myrica californica (a california native) and Laurus nobilis.